This is my great grandfather’s WW2 draft registration card. 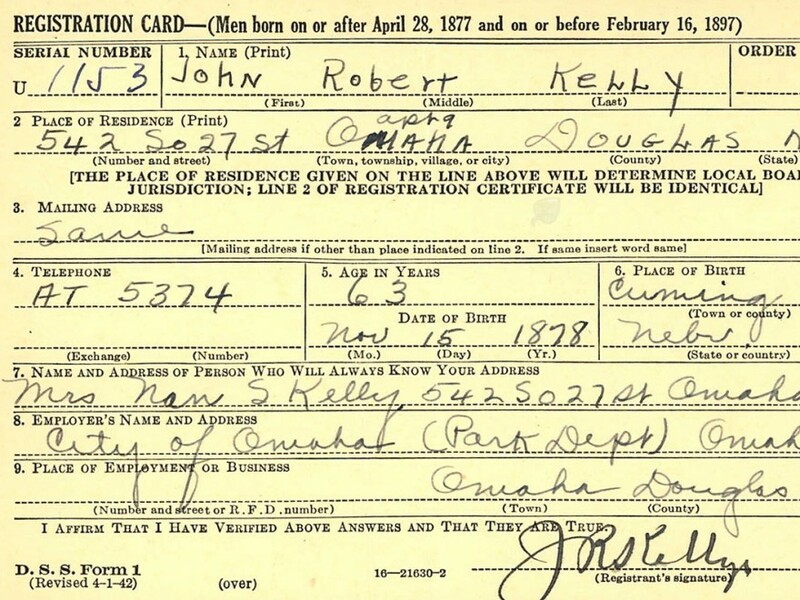 John Robert Kelly claims to have been born on 15 Nov 1878 in Cuming County, Nebraska. He lists his address as 542 South 27th Street, Apartment 9, Omaha, Douglas, Nebraska. His lists his age to be 63 years old. He claims to work for the City of Omaha (Park Department) in Omaha, Nebraska. He lists a person who knows his address as Mr.s Nan S. Kelly, at 542 South 27th Street, Omaha, Nebraska. Ancestry.com. U.S., World War II Draft Registration Cards, 1942 [database on-line]. Lehi, UT, USA: Ancestry.com Operations, Inc., 2010.